I don’t know what I think of this whole Germany thing yet. On one hand, it’s exciting to be in a foreign country and all, but I don’t think I like it. It may very well be because I have never lived in a large city before, and it is a huge change from rural Iowa life. However, it may be something else. This trip has really highlighted how many things we take for granted as “normal.” For example, most public bathrooms here require you to pay. That was quite a surprise when I found out I might add. It’s other things as well. No one smiles here. I’m cognitively aware that Americans smile much more than other cultures, and I know Germans tend to be more reserved with outward expression. It still bothers me though, even though I know people don’t mean anything by it, it’s just how they do things. There are so many cultural behaviors that seem normal until you go somewhere else. The differences aren’t only cultural though. They are also pragmatic as well. I can honestly declare that I think the Euro and German pricing models are far superior to their US versions. Euro bills change size and color based on value, providing tactile feedback on value. A far superior system than homogenous green bills. The coinage is great too. The coins are worthwhile amounts! Dollar, 50 and 20 cent values make the coins worth using. Don’t get me started on public transit. It’s fantastic. It really is. The US system is abysmal in comparison. I’m looking forward to the rest of the trip here. After being in Germany for a week, one thing that struck me is how normal life is just normal life no matter where you live. I had an idea in my head that Germany would be a special place with extraordinary food, people and culture, but after spending some time here I realised that you get used to the normal things in life wherever you are. I miss free refills for drinks, and I miss free water. I wish the drinking age was lower back home. The holocaust museum in Berlin was the first actual holocaust museum that I have been to, apart from a few monuments.But this does not mean I have known nothing about it. Throughout my schooling years I have read book after book of stories about people’s stories. Also quite a few of movies who’s soul purpose was to show the atrocities of the war. However standing in the place where it happened is a wholly different level on its own. I walked the Sachsenhausen camp by myself with the audio tour not speaking a word. The place in the camp that was the hardest to come to terms with where the three lumps in the ground that where the three mass graves that where found outside of the crematorium. Over 40,000 people’s ashes had been thrown in those holes. I stood there and stared at it. There was nothing else I could do, silence was the only thing someone could do. What’s it like in Germany? Well it’s safe to say that Germany is different from being in the states. One of my favorite differences though, is that they have a great love for bakeries. Back home I would occasionally go to the local bakery of my home town, and it was the only place you could buy fresh breads and doughnuts made the night before. In Germany there are bakeries every where. It’s really nice if your looking for a pastry for breakfast or a sandwich for lunch. It makes me wish they had a few more back in the states. Another thing I noticed pretty early on was that the people act a bit different. I’m from a pretty small town in Minnesota and I generally will hold door for people and smile at them even if I don’t know them. This is not how Germans do things. At least not in Berlin. I’m not saying they are mean or rude, but they like to mind their own business and expect others to do the same. Something else that took a bit longer to notice was the amazing transportation system they have in Germany. In most of America we are used to driving almost everywhere ourselves. In Germany there really isn’t a need as long as you have a transport pass. The busses and trains can get you anywhere in the city and they are almost always right in time. It was a very convenient thing to have as a visitor because it wasn’t a problem if I wanted to go anywhere. I could just take a train down to a nearby bakery. Germany is a different place and an amazing experience I’m blessed to have. 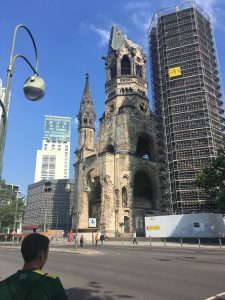 Author Ryan KoehnPosted on August 22, 2017 Tags blogQ2Leave a comment on What’s it like in Germany? a decently sized building that had sustained damage from bombs during the war, but has since become a memorial to Berlin’s past.